St. Louis, Missouri - July 17, 2017 - Belden, Inc., a global leader in signal transmission solutions for mission-critical applications, has released its new DataTuff Cat6A PROFINET cables, designed to support the growing demand for high-volume data transfer from the factory floor. These cables transmit data up to 10Gb/s and provide the reliable, ruggedized and flexible connections required in environments built for the Industrial Internet of Things (IIoT). Easy to use. Fast connections make installation a seamless and effortless process. Flexible. Finer conductor stranding and more flexible jacket options offer extended uses for the Type B cables. Reliable. The materials used in the cable design withstand harsh conditions, which lowers risk and optimizes network efficiency and reliability for mission-critical applications. The new cabling enhances Belden’s entire PROFINET product family, and with Hirschmann switches and Lumberg Automation connectivity components, engineers have a single source for all Ethernet-based devices and support services. “Network engineers can now easily connect their devices across all systems for efficient automation,” adds Negriu. For more information on DataTuff Cat6A PROFINET cables, visit www.beldencables-emea.com/en/products/industrial-cables/industrial_data_cables/industrial-ethernet-cables/profinet-cat-6A/index.phtml. In a world moving toward new levels of interoperability made possible by the Industrial Internet of Things (IIoT), visibility is vital to operators as they face increasing demands to receive, analyze and share data. Belden’s industrial connectivity solutions address these needs head on. With more connected machines, rising data volumes and increasing productivity demands, customers can count on Belden cable and Lumberg Automation and Hirschmann industrial connectors for a complete communications infrastructure designed to last. Belden’s customized systems provide high levels of performance and reliability to help a wide range of industrial automation applications handle the growth of intelligent, networked devices and robust analytics. 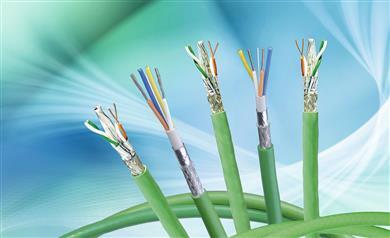 Visit www.belden.com/products/industrialcable/index.cfm to learn more. Belden, Belden Sending All The Right Signals, Lumberg Automation, Hirschmann and the Belden logo are trademarks or registered trademarks of Belden Inc. or its affiliated companies in the United States and other jurisdictions. Belden and other parties may also have trademark rights in other terms used herein. Belden releases new category 6A PROFINET cables for data-intensive IIoT environments.